The Keyline system has changed only slightly from my father, P.A, Yeomans’ original books on Keyline. 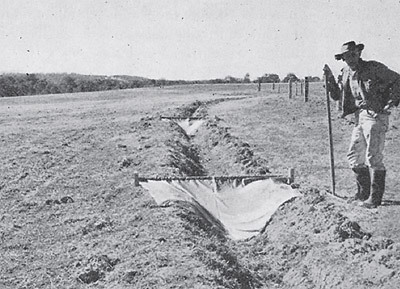 The main change started in the late 1960s with our work on developing a ripper with almost zero disturbance of soil layer profiles. The modern subsoiler was born and highly accelerated Keyline soil fertility enhancement became possible and practical. There are two facets to Keyline. The FIRST teaches how soil fertility can be rapidly, permanently and cheaply enhances. The SECOND teaches how the topography of the land can be best utilized to build that fertility and additionally how to plan the farm layout. Keyline planning is based fundamentally on the natural topography of the land. It uses the form and shape of the land to determine the layout and position of farm dams, irrigation areas, roads, fences, farm buildings and tree lines. Today, Keyline topographical concepts are often taught in university town planning courses. Keyline is an agricultural system in which great emphasis is placed on processes designed to increase substantially the fertility of soils. Emphasis is placed on the creation of a soil environment that rapidly accelerates soil biological activity, thus vastly increasing the total organic matter content within the soil. profitable to the man who farms the land. as rapidly as possible, run-off water off a rural landscape. as a significant issue becomes totally meaningless. of turning storms into steady soaking rain. The Keyline contour need not be on the individual farm. soil fertility building practices anywhere in the world. we discovered the Texas built Graham Hoehme Chisel Plow. the more extreme conditions usually found in Australia. wide spread acceptance by both farmers and other manufactures. storage sites, and even more rapid fertility build ups. 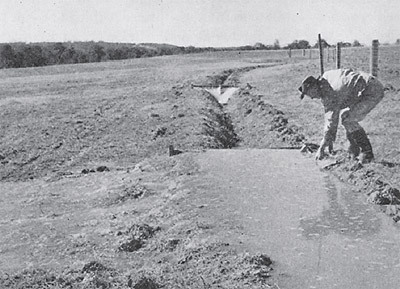 Larger farm dams have tended to prove more viable. systems that otherwise, just possibly, could not exist. by the weathering of geological formations over millennia. of agricultural land has a basic fundamental consistency. very unique contour that occurs in all primary valleys. slope of the valley ﬂoor will suddenly increase. diagram indicates the terms used in describing Keyline concepts. the ploughed furrows will no longer be on a true contour. a valley, which naturally increases its eroding action. of rainwater drift and ﬂow over the land surface. succeeding ploughed furors away from being true contours. along with its associated Keyline. away from the valley’s Keyline. forcing runoff to concentrate into the valley centre. the level of the Keyline in the next valley downstream. absolute control of the system and pumping becomes unnecessary. irrigation paddock.P.A.Yeomans demonstrates his system. 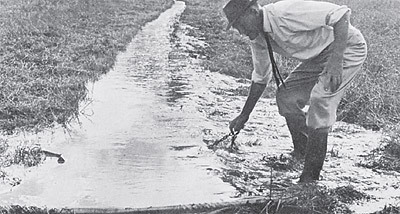 of old mining water handling techniques to agriculture. the moving ﬂoodwater and so decrease its velocity. water. Even in steep country the land won ’t erode. ponds can vastly accelerate soil fertility development. and ﬂood down the slope. to form both windbreaks and shaded areas for livestock. Trees are ultimately harvested and the tree belts replanted. and should be an underlying fundamental of all farming endeavours. reduces costs. Additionally, less water is required if irrigation. bits randomly clump together and form crumbs or aggregates. should be abandoned and herbicides be used to control weeds. are supposedly to be grown using only seed and chemicals. of passages in a well-structured soil, hunting for nutrients. area to produce a constantly decomposing mass of root matter. 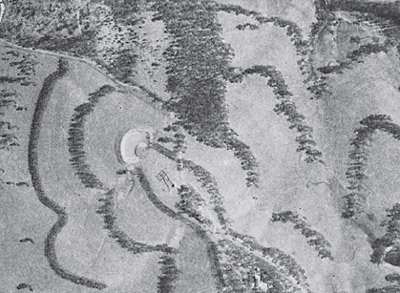 experimental farm at Badgery ’s Creek NSW in the 1960s. “conventional ”agriculture in this country. We see Keyline concepts and philosophies adopted everywhere. thinking. It is a marketing reality that big money talks. totally relies on and is dependent on, high chemical inputs. and even whole towns could be planned based on the concepts. in Hobart, began an unlikely but highly productive collaboration. these buzzwords have created, become irrelevant and unnecessary. and forming humus consumes huge quantities of carbon dioxide. to achieve that worldwide imperative.